Namibia became independent on March 12, 1990, after being administered by South Africa since 1915. South West Africa (Suidwes-Afrika in Afrikaans) was established as a German colony in 1884, and attracted German and Afrikaner settlers. In 1915, as part of the South African effort in World War I, South African troops invaded and occupied the territory on behalf of the British Empire. In 1917, the League of Nations granted South Africa a mandate to administer South West Africa. From the 1950s onward, South West Africa was administered in essence as South Africa's fifth province, and therefore used South African Rand (see the South West African Currency page). 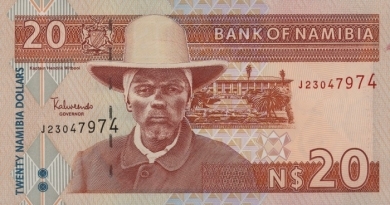 For the first year after Namibian independence, the South African Rand remained the country's legal tender. 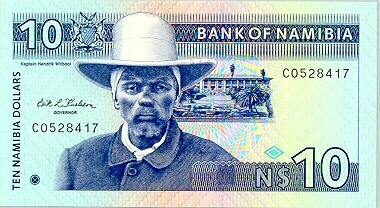 The Namibian Dollar ($N) was introduced in 1991, and was pegged to the South African Rand at the rate of R1,00 = $N1,00. Outside Namibia, the unofficial exchange rate was $N1,00 = R0,70. The South African Rand remains legal tender within Namibia at the offical 1:1 internal exchange rate (March 2009). 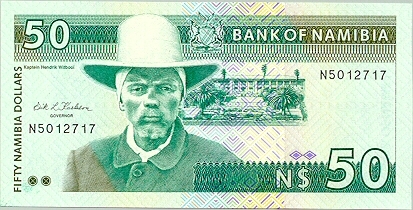 Namibia's banknotes feature the face of the Nama Chief, Hendrik Witbooi (1835-1905), known by his Nama name of !Nanseb /Gabemab. The Nama are a sub-group of the Khoikhoi ("Hottentot" or Bushmen) people, and had migrated to Namibia from the Western Cape area of South Africa. Both Hendrik's father and grandfather were chiefs of the Nama tribe, and Hendrik eventually rose to become chief after killing Paul Visser, who had killed his father Moses Witbooi to become the chief of the Nama (1887-88). German colonists began arriving in 1894, and Witbooi spent the remainder of his life leading his people against the German colonists. He was killed in battle at the age of 70, of a wound to the thigh that he received on 28th October 1905 near Vaalgras. His dying words were "It is enough. The children should now have rest", and the Nama eventually signed a treaty with the Germans. Hendrik Witbooi's great grandson, also named Hendrik (born 1934, Nama chief since 1978), is a former Deputy Prime Minister of the Republic of Namibia and a former Vice President of SWAPO (1984-2002).